Cooked this yesterda y when ma-in-law came for dinner. 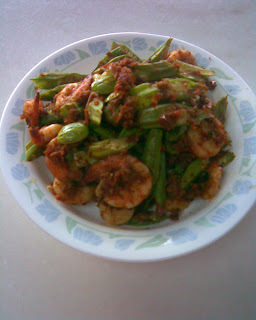 This is a hit amongst us who love petai and spicy food. A simple dish; but of course must have sambal (which is easy; ma in law made for me prawn shrimp sambal or just get the chilli paste from market). Petai is real powerful. All of us are into it except Dan. Lyn is crazy over petai and even ma. I will steam for her separately as she doesn't take chilli. Suppose to have lots of goodness but the smell after that......esp from the one I sleep with. How many times I've jumped out of bed and rushed out of the room for fresh air.